Warm Up With Actions– Do the actions and have your students repeat and do after you: clap your hands, clap, clap, clap. Shake your hands, shake, shake, shake. Wash your hands, wash, wash wash. Come up with your own! Song Time-Warm Up Action Song. I like to warm-up with a song like Head, Shoulders, The Good Morning Song, or Open Shut Them. Practice Counting Numbers- Use flashcards or your fingers, or objects to count from 1-10. You can count higher if your students are ready! 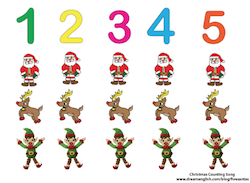 Song Time- Sing the Christmas Counting Song, check that out and get a free download and poster here. Fore more Christmas songs, check out our Jingle Bells Page here. Christmas Vocabulary Practice- Introduce 6-8 words about Christmas. For example, Santa, reindeer, elf, Christmas tree, presents, toys. MES English has some great free printable flashcards for this vocabulary. Game-Practice the Christmas vocabulary with a simple game. Check out our game ideas here. Book Time- Read a simple picture book about Christmas. Find something in your local library or bookstore. There is a free downloadable Christmas Book here. ABC Practice-Show the students that Santa is spelled S-A-N-T-A. Then practice saying the letters A to Z and sing the ABC Song. Review Time-Quiz the Christmas words. Show a flashcard to your students and see if they can remember. If they are young, you will have to help them and give them little hints. It is ok if you have to say the word for them as they are just learning. Goodbye Song-Sing the Dream English Goodbye Song and wish your students a Merry Christmas! These are my ideas to get you started. Feel free to add, expand and make this into the best lesson for your students. Keep it fun and relaxed! Merry Christmas! For more Christmas resources, click here.